First up: Turkey Leek Shepherd's Pie with a Gruyère Crust. This is a recipe I created after Thanksgiving last year and I'm likely to repeat today. I rolled out the pie crust scraps leftover from my Pear Gruyère Pie for the bottom crust and made a simple roux with the leftover turkey stock. 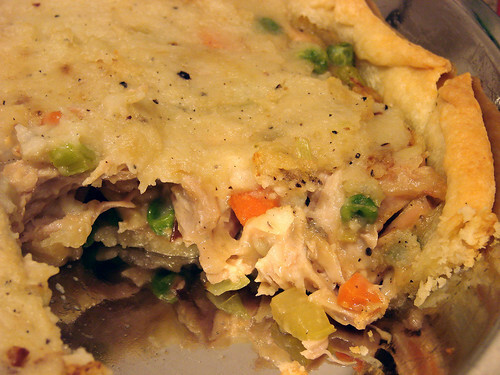 If you don't happen to have gruyère crust scraps in the freezer you can make a half recipe or better yet, make a full crust recipe and freeze the rest to use for future pot pies or cup pies. For the filling I chopped and sauteed one leek, one carrot and one stalk of celery in some hard cider while I heated up about 1/3 cup of frozen peas and shredded 1 1/2 cups of left over dark meat. I mixed the filling together and added it to my pie plate topping it off with leftover mashed potatoes and baked it at 350 for about 30 minutes. Huge hit. There's wasn't so much as a sliver left. Stuffing with eggs...a breakfast of champions. Stuffing is one of those things that I really only eat at Thanksgiving and maybe Christmas. Why do I always forget how tasty (and comforting) it is? And it makes for a hearty breakfast when served with eggs and gravy. Last year we made this Gourmet Magazine's Herbed Oyster stuffing recipe we found by way of Epicurious. How could bacon, garlic, oysters and cubed bread be delicious more delicious? If you serve it with sunny eggs and gravy! 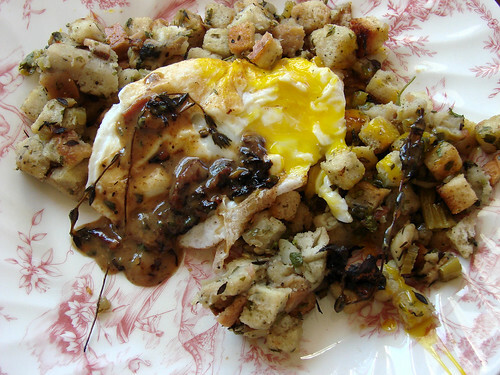 The eggs, gravy and stuffing combo works with any kind of stuffing, but the oyster stuffing was especially delicious. And you can't forget turkey noodle. 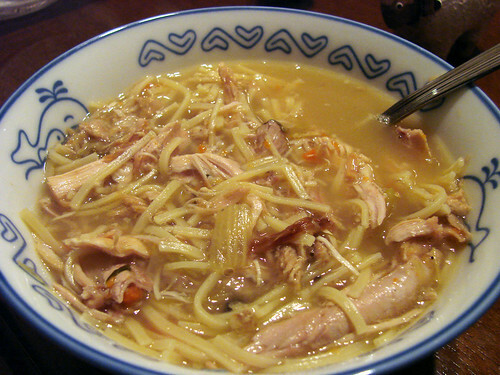 Just take the leftover meat and turkey carcass and substitute use it with your favorite chicken soup recipe. Warm and delicious. The perfect post shopping meal. Are you all turkeyed out yet? What do you plan on doing with your leftovers? @S-luv: thanks so much! I definitely recommend the Shepherd's Pie. The Gruyère is AWESOME. Stay warm!